Lexington, Ky. - Nov. 7, 2018 - M. Michael Meller and Gallagher/Meller Sport Horses are proud to be a supporter of the National Horse Show, an exciting World Cup qualifying event held this year from Oct. 27-Nov. 4 in Lexington, Kentucky. While at the National Horse Show, Meller presented this year's M. Michael Meller Style of Riding Award to Molly Ashe Cawley. An accomplished hunter/jumper rider and trainer, Ashe Cawley operates her Norfield Stables based out of Newtown, Connecticut, Briarcliff Manor, New York and Wellington, Florida. Some of Ashe Cawley's career highlights include two Super League team victories in Hickstead, England in both 2007 and 2009, as well as numerous USHJA International Hunter Derby victories. This summer, Ashe Cawley had a one-two finish in the $35,000 Great Lakes Classic CSI3* at the Great Lakes Equestrian Festival aboard D'Arnita and Cat Ballou, respectively. 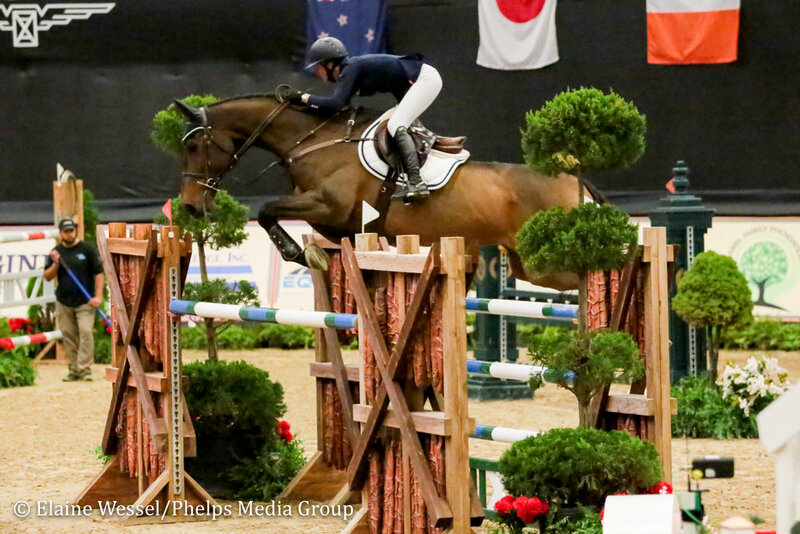 The talented rider then made headlines for her success at the Hampton Classic Horse Show where she won the $10,000 Palm Beach Masters Open Jumpers out of 68 entries. To kick off an incredible fall show season, Ashe Cawley topped the highly-coveted $204,000 Longines FEI Jumping World Cup™ New York CSI4*-W at this year's American Gold Cup. "I feel extremely flattered," Ashe Cawley said upon receiving the Style of Riding Award. "Michael is always there boosting us up and cheering us on through every minute of everyday, through thick and thin, through good times and bad times, so it really means the world to me that he chose me for this award this week. I really appreciate it." "I think [the Style of Riding Award] is important for the people that it represents and for the people who are behind it and for the reason that it exists. I think there are a lot of people out there trying to do things the right way that don't often get rewarded for it in this sport. It's really refreshing to have an award out there like this one. Like Michael said, sometimes he picks the youngster who is trying to do it right, who is feeling a little bit beat up for it, and he'll choose them to give them that lift, to tell them 'C'mon, keep going. You're on the right track.' I think there's always room for those kinds of awards and I think they mean a lot to the people when they receive them." Meller commented, "I've known [Ashe Cawley] all throughout her career. She is a fierce competitor. She is a really cool girl and tries hard, works hard and is very dedicated. She's deserving of an award like this because she emulates everything this award stands for."